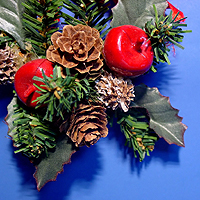 Wishing Our Readers a Joyous Holiday Season and a Happy, Healthy & Prosperous New Year! Josh Goldstein is a registered architect in New York State and is based in Brooklyn, NY. He earned his Bachelor of Arts from Washington University, where he studied Architecture and Spanish. He earned his Bachelor of Architecture from Pratt Institute. His career path has led him through several notable New York City architecture firms, specializing in a diverse range of projects such as health care and educational facilities, high-end residential, multi-family dwellings, and restaurants. While at these firms, he worked in all phases of design, from initial client meetings and schematic design, to construction documents and pricing, through to finish selections and construction supervision. Josh also has significant experience handling zoning, landmarks, ADA, and permitting issues. Over the years Josh has had the opportunity to work on a growing list of his own projects. The projects started out kind of small, with jobs like a bathroom in a homeless shelter, grew a little in scope with the likes of a music studio, an apartment renovation and Harlem supper club, and have recently included vacation homes in Maine and Mexico. A luxurious tropical beach house with warm breezes, vast ocean views and light open spaces would be a dream for most, particularly those of us in northern climates who endure cold, snowy winters. This dream is one that architect Josh Goldstein made a reality when he designed "Casa Papagayo", a vacation home for his parents in Akumal in the state of Quintana Roo on the Yucatan peninsula in Mexico. When the property was purchased in the late 1990's, Goldstein first designed a small house on the site where his parents could stay and get a feel for the area. He left as much of the property open as possible for the next phase of the project, but years later when a five-story condo was built right on the property line adjacent to the house, it forced Goldstein to abandon any plans he had up until that point and prepare a new design. Goldstein explains, "The large new condo is a really ugly building so there was no point in creating spaces that would look at that. So we put a lot of our house up against it, which left much of the site open for a large pool and deck, and also the site's natural jungle landscape." 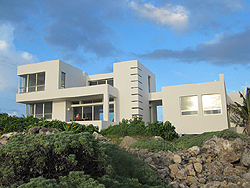 This new design was completed 2-1/2 years ago and the result is a modern beach house that is filled with light, air and sun and is comfortable in its simplicity. Horizontal lines in wood and shadow repeat in the structure, lending an atmosphere of serenity. That's Goldstein's style, when he's not doing building renovations in Brooklyn. He explains, "When I work in Brooklyn, I'm doing old houses, gut renovations and a lot of it is a more traditional style. If I'm doing a ground up building, this is my style, and doing a house like this in Mexico really allows that style to shine through." "I like having spaces where the outside is synonymous with the inside and there's not a hard line between the interior and exterior spaces. In this house, the living room is outside as much as it is inside. There is no real front door, there's just a sliding panel of four doors that pocket into a cavity wall on both sides - on the ocean side and on the pool side. When that is open, the living room extends all the way out onto the deck facing the ocean and it extends out to the pool deck and then cascades down to the pool. All of this becomes living space that doesn't have to be differentiated as it would in northern climates with an inside and outside. It's all one space that flows together. That's the great thing about designing in a tropical climate." The location of the house also helped with another important element, which was air flow throughout the building. Goldstein explains, "Being on the ocean offered us a great opportunity because there is a constant breeze which can be almost heavy at times. I really didn't want to have air conditioning in the house because I felt that once the house is air conditioned the whole idea of having everything open to the pool, to the ocean and to the jungle is negated. All of a sudden all the doors are kept closed, you're in there in a little cocoon where it's always 72 degrees, the television is on and you can't hear the ocean. We designed for the opportunity in the future to have air conditioning, but currently the house doesn't have air conditioning. 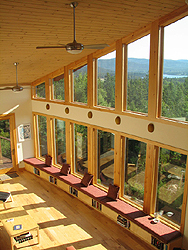 There are high velocity fans in all the rooms, so the windows can stay open all the time. I've been there in the dead of summer and even then it's pretty comfortable. Not having air conditioning really opened up the house to be a truly tropical house rather than climate controlled." "Once we decided not to have air conditioning, the next question was whether or not to have screens for mosquitoes and other bugs, and that was another thing I didn't want to have because I thought that screens would diminish the view. Also, with the constant ocean spray the screens would get drops of water on them and that would again diminish the view, so I was pushing for the idea of no screens. We did a lot of tests on the site and because of the heavy breeze that's always there, there really are very few bugs in that location on the coast. Even in August when the breeze is lighter, as long as you keep the fans on, there really isn't a bug problem." "In the stair tower we made a decision to keep that open too. Even when there are heavy rains, the rain comes in and you have to be careful going up the steps. We gave the concrete on the steps some traction so it's not slippery, but it's completely open and I think it adds to the sense of openness of the house. There's always a nice breeze coming through the stairwell when you're going from the living room up into the bedroom area. You're always completely connected to the sound and the ocean breeze." Even though the house is open to the elements, there is also a sense of privacy and mystery that has been incorporated into the design. One unique feature is a stone wall that leads to the entrance to the house. In the wall there is a series of four square portholes with aqua blue water showing through. Goldstein explains, "That's the wall coming up from the street and it is one of the first things you see when you get to the house. I wanted to give the house a sense of mystery, so as you're coming up from the street you pass through a somewhat narrow space with several steps. The wall is about seven feet high, so you don't have any indication of the ocean but you do get a peek at the house. You don't know that the stone wall is the west wall of the swimming pool except for the fact that you have those portholes giving you a sneak peek of what's to come. And because of the movement of the water, there are some interesting blue shadows on the concrete and on some of the surfaces. Past that wall there is another series of gradual steps that go all the way up to the house. That is when you get your first view of the ocean." Goldstein opted to forego adding a traditional driveway to the house to keep it more private. "A lot of the houses in the neighborhood have sort of an American style driveway, but in this house there is no driveway. The cars come right from the street into a two-car garage underneath the original house. Beyond that, you walk through a terrace and landscape to get to the house. When you're going down the street you can't see the house, so we managed to maintain the idea of mystery and seclusion." All in all, the house turned out to be a perfect place in a tropical paradise, and one that is sure to please its owners for many years to come. Copyright Devonian Stone of New York, Inc. 2012. All Rights Reserved. Content may not be copied or reproduced in any way without the written consent of Devonian Stone of New York, Inc.